We met Mark in the parking lot of Six Flags Fiesta Texas after waiting in line for the park to open for more than an hour in the Texas sun. If I can digress for a sec and tell you about Mark. He is a solider that was in the Army and saw combat in the worst way. We started training Ragnosh (Rags for short) for him when he and his family were still living up here in Fairbanks, Alaska. Rags spent the better part of his first year with us in training and some of that time with Mark and his family. They got to bond with him and became pretty close. When they had to move to Texas we promised that we would fly down with the dog and deliver him. We have done this several times with our service dog clients. 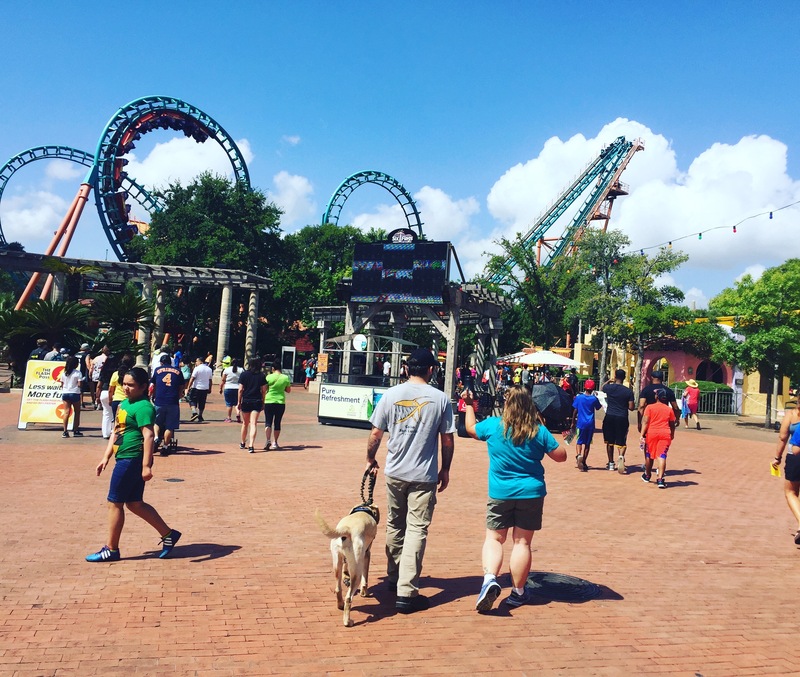 It is a service that we offer but in fine rock n roller coaster tour fashion, this was the first time we ever delivered a service dog to a theme park and performed the public access test amongst thousands of people. It was a first for us but we were sure Rags would perform well. We all zipped through the gate and were in the park in just a few minutes and we started walking around with all the people and craziness that is a theme park in the middle of summer. It was very hot and Rags had only been in Texas for a day so we had to make sure he not only performed well for his test with Mark but to also make sure he was cool and remained hydrated. We walked all over the park doing the test. We went into stores and bathrooms and ate lunch and mingled with all the people. He passed the test with flying colors and we are proud to say that Rags in now a certified service dog through our Lead Dog Service Dog program! We said our goodbyes to Mark and Rags and had plenty of time to hit the coasters in the park. We rode several coasters in the park. This was a rather small footprint for a Six Flags, at least compared to the ones we have visited thus far on our coaster tour. Did you know that it is built inside an old quarry? 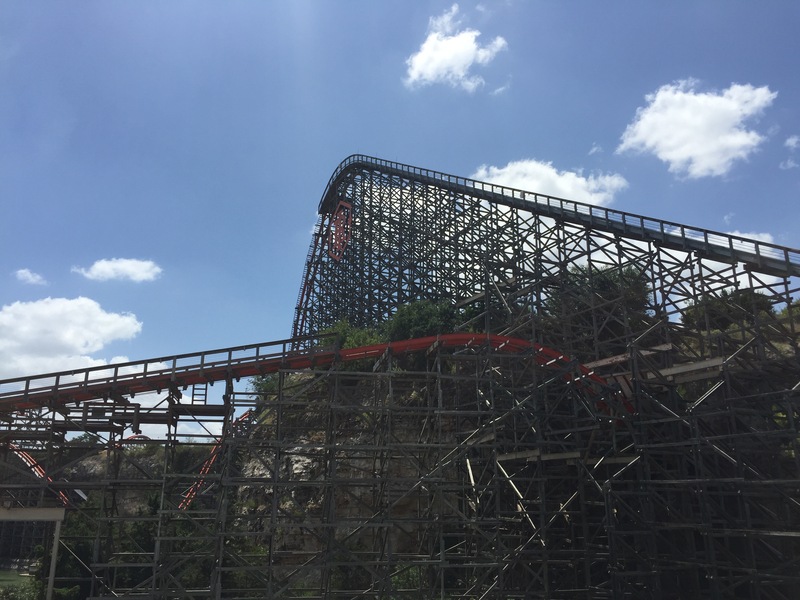 The deep slopes surround the park on three sides and you can tell you are deep in the heart of Texas with all of the southwest and Mexican themes. One of my favorite things about visiting theme parks across the country is checking out all the cool ways that the parks are themed. 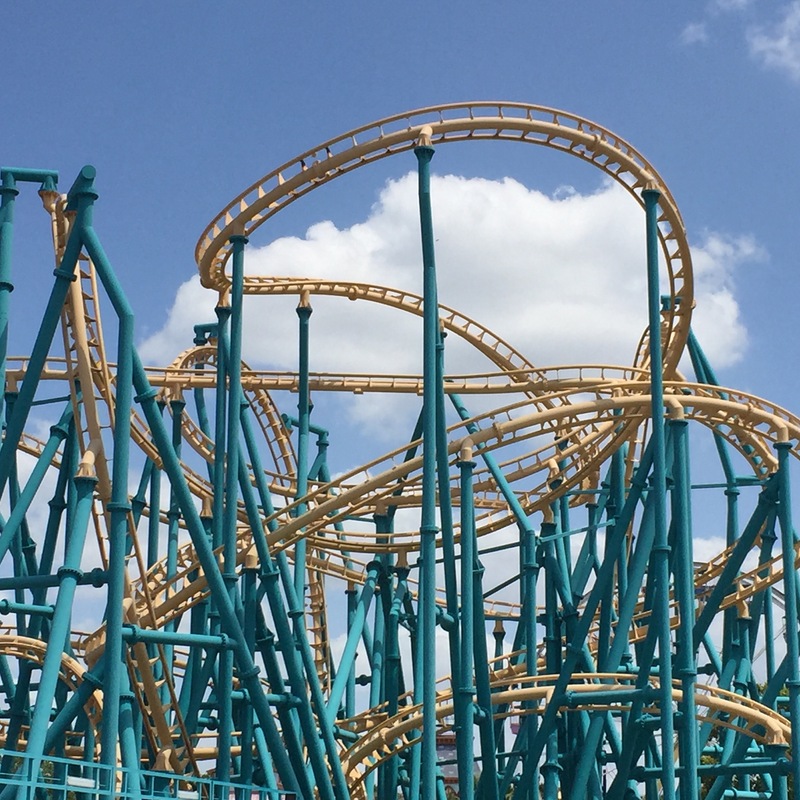 My favorites are Busch Gardens Williamsburg in Virginia with its Old World Europe theme and next is the little Holiday World park in Santa Claus, Indiana. First up was again, Batman the Ride. I don’t know why I keep riding this one. They are almost all the same as the others in the Six Flags family but there is a thing for coaster enthusiasts that is called a coaster total. Some people have ridden hundreds of coasters and hold up signs in pictures for important milestones like 200, 30, or even 750 rides! Imagine being on 750 roller coasters? We have been on about 200 in the last couple years on our coaster tours across America but we have a lot more to go. The Iron Rattler is a force to be reckoned with and a unique technological marvel, combining a classic wooden support structure with modern track and rails crafted of steel . 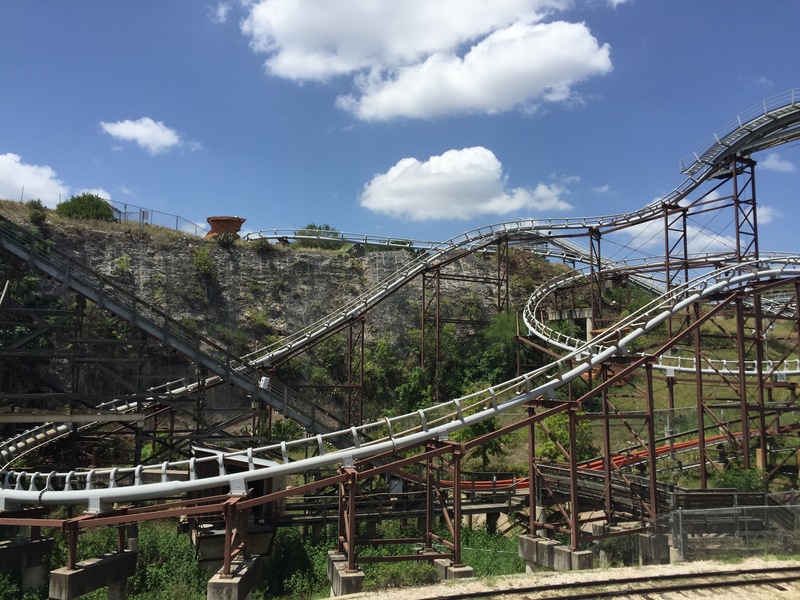 “Six Flags has innovation as part of our DNA and the Iron Rattler will take extreme innovation to a new level with a taller drop, faster speed and steeper banks. 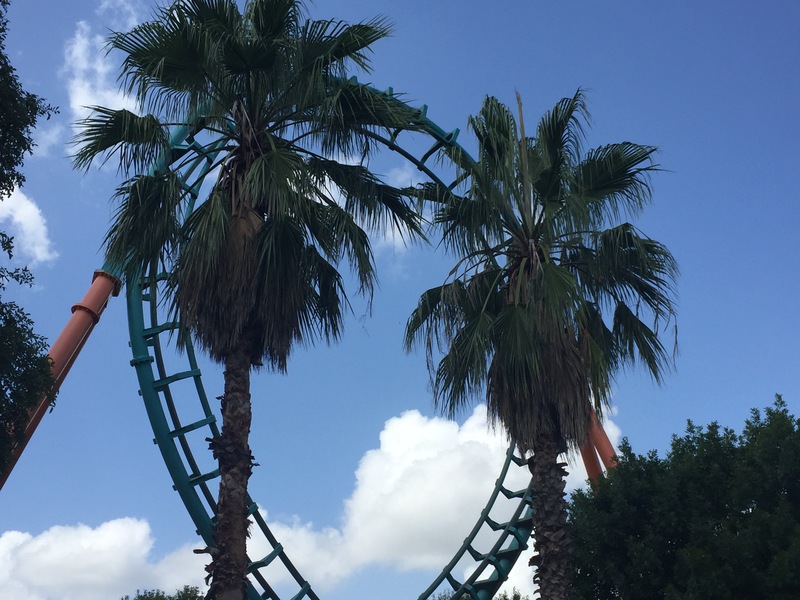 This cutting-edge coaster truly marries the best of both classic and modern coaster designs to deliver heart-pounding thrills,” said park president Martin Bozer. The Iron Rattler was a fun one! Even though we waited a long time in line it was well worth it. Those banked turns were absolutely amazing, the air time and the g-forces made this a coaster that will rank in the top ten of the tour for me. The last coaster we rode was Poltergeist. It was one of our favorites! It is an older launch coaster, meaning instead of going up a big hill and then down a dip towards the rest of the coaster, this type shoots you like a rocket down the track out of the ‘barn’. Poltergeist reminds me of a bowl of spaghetti. There are so many loops and twists and turns and it is so fast, it is hard to get your bearings before you are being flipped and flung around. After leaving the park we met up with another one of our service dog clients for dinner at a Mexican restaurant not too far from Six Flags. It just so happened that two of our clients live in the same city and it all worked out that we could see both in the same day! 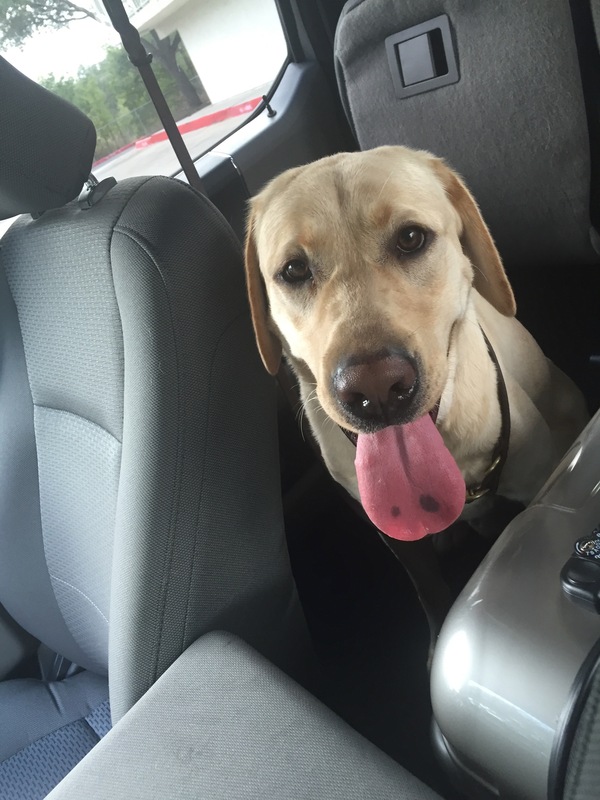 This dog is named BreBre and she is a service dog for a young teenager named Josh. They too used to live here in Alaska and BreBre holds a special place in our hearts. This little dog was actually one of our sled dogs, born in our house, but was too small to run on a team so we decided to see if she had what it takes to make a service dog. She worked with us and with Josh and his family for well over a year before they moved to Texas when his family was stationed here in the military. BreBre joined us for lunch as we spent more than an hour catching up with the family. It was great to see them again! Tonight we would drive a long way, all the way to north Texas and Amarillo as we made our way towards Denver, Colorado. Little did I know to get to Amarillo we would spend the better part of eight hours on the back roads of Texas on alternate highways but still flying down the road at 75 miles per hour. We passed through cattle farms and oil fields as we worked our way north. Michele read aloud the entire manual for a get rich multi-level marketing scam that so many of our friends/clients are head over heels for. Who buys that crap anyways? Why would you buy a $30 four pack of energy drinks that you can pick up at the local 7-11 for a handful of pocket change? What is this crazy wrap thing anyway? How can anyone truly believe they will actually loose weight with a roll of Saran wrap placed around your flabby belly and thunder thighs! Needless to say, Michele won’t be quitting her day job to open up a pop-up home business for just a simple payment of $99.99. If this is something that does interest you by the way, I know someone who has a garage full of Shakeology that they’re looking to pedal. Go Diamond, It Works! We arrived well after midnight and didnt even unpack our bags when we reached the hotel. I don’t think we even turned on the lights before we turned down the covers and went to sleep. Tomorrow we would finish this leg of the trip and make it back to Denver. Our amazing travel triangle would be complete but we still had quite a bit to do!